Since 1986, Hard Blok offers maximum strength, vibration dampening, and heat dissipation in engines. Pit Stop USA is The Online Motorsports Superstore! 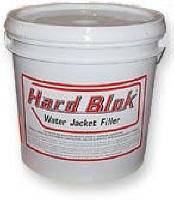 We feature Hard Blok Water Jacket Filler products. Hard Blok Water Jacket Filler is a specially formulated, cement-based product with refined, size-graded iron particles combined at an optimum ratio to provide maximum strength, vibration dampening, and heat dissipation required in high performance race engines. Its coefficient of thermal expansion is identical to cast iron engine blocks. Hard Block has been tested and proven effective in aluminum blocks. Hard Block remains stable at all operating temperatures. Does not soften when exposed to high heat, nor erode under water. Hard Block fills the smallest spaces in the water jacket. Does not shrink or pull away from the cylinder walls. Does not expand. Hard Blok extends cylinder wall life both by preventing cracked walls and by causing the walls to wear truer. Honing is minimized during rebuilds. Hard Blok provides a race-proven advantage used by winners in all types of racing since 1986. Hard Blok is non-hazardous and non-corrosive. Contains no toxic material. Once hard, it cannot be removed from the block. Order the Hard Blok TALL FILL Unit for 350 cubic inch and larger blocks. Order the Hard Blok SHORT FILL Unit for circle track and street rod applications. Detailed instructions and contingency decals are shipped in each unit. To avoid coolant flow restrictions, check flow requirements and the pattern of your particular block before filling. Hard Blok becomes permanent and cannot be removed after hardening. H & H Specialties, Inc. cannot be responsible for any coolant flow blockage or overheating problems caused by installation of water jacket filler. We feature Hard Blok Water Jacket Filler at low everyday prices!